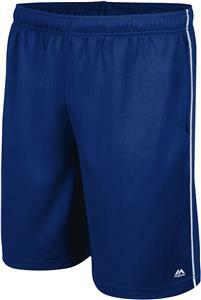 Majestic Mens Youth Premier Mesh Travel Shorts. Perfect for training, perfect for travel, the Premier Mesh Travel shorts will be your go-to shorts for confort and performance. Made for the elite athlete, as well as Travel, High School & College teams. Perfect for training, perfect for travel, the Premier Mesh Travel shorts will be your go-to shorts for confort and performance. Made for the elite athlete, as well as Travel, High School & College teams. 100% Polyester Victory Mesh 10" inseam Side Pockets Contrast Piping down sides. Elastic waistband with drawcord.